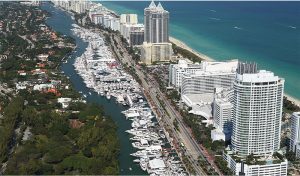 Insider tip: Don't confuse Yachts Miami Beach with the Miami Boat Show : Atlantic Yacht & Ship, Inc.
It’s that time of year again – time for the Miami yacht shows. But be careful not to confuse the Yachts Miami Beach event with the Miami Boat Show. Otherwise you will brave the dense traffic to get to potentially the wrong place! In the first place, this is the 29th annual Yachts Miami Beach event. We at Atlantic Yacht & Ship will have our display at the Yachts Miami Beach event on Collins Avenue. If you are looking for the best deals on beautiful used motor yachts at the show then we are your place. Furthermore, new Pearl yachts and new Greenline yachts will be displayed through us as well. So we really are your one-stop-shop! To sum up Yachts Miami Beach, it is the city’s premier luxury yacht show. This year, it takes place February 16 – 20 on Collins Avenue. Directly across from the legendary Fountainebleau and Eden Roc hotels. This in-water-only display consists of both new and pre-owned yachts of all sorts. Moreover, the show covers more than 1.2 million square feet of space spanning from 41st street to 54th street. The world’s most extraordinary and uniquely designed yachts and super yachts from around the world will be on display. Custom boat builders are included as well! Come by and say “hello” at our display!